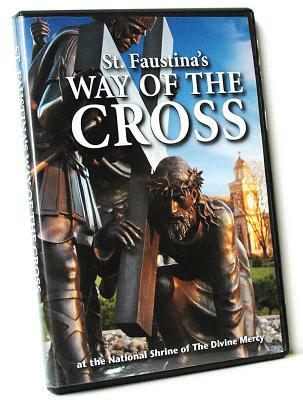 Compiled by St. Faustina's religious community in Poland, St. Faustina's Way of the Cross combines the scriptural Stations of the Cross with passages on the Passion from the Diary of St. Faustina. Led by Fr. Joseph Roesch, MIC, this beautiful prayer is accentuated by dramatic footage capturing the riveting bronze, life-size Stations of the Cross visited annually by thousands of pilgrims on Eden Hill. Through this beautifully created DVD, take the path traversing the National Shrine's hilltop meadow, hear the prayers of St. Faustina, and join in the group response, "Christ Jesus, have mercy on us."